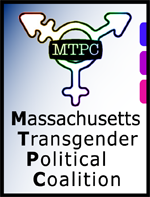 Massachusetts Transgender Political Coalition (MTPC) Steering Committee elections are tonight. The voting membership of MTPC -- those members who have been reasonably active with MTPC over the past several months -- will elect a new Steering Committee at the general membership meeting. I'm running for one of the at-large positions, and plan to focus on training and faith (religion, spirituality, etc.) work; teaching people about transgender people, helping faith communities become more welcoming and inclusive of transpeople, and creating more allies for our work towards social justice. "I'm a transgender leader specializing in faith, religion and spirituality. I'm a Co-Chair of the Interfaith Coalition for Transgender Equality (ICTE), Acting Chair of Training here at MTPC, Emeritus Founding Chair of the Transgender Working Group (TWiG) of Keshet (Hebrew for "Rainbow," the local and national GLBT Jewish organization), a board member of Congregation Am Tikva ("People of Hope", Boston's GLBT synagogue), and a member of Saint Luke's & Saint Margaret's Episcopal Church (alas, closed last month). I was born in greater Boston and have always lived here. I came out as a lesbian when I was a freshman in high school and have had a queer career in all senses ever since; I came out as transgender when I was a senior. I'm thirty-three, and identify as female, queer, transgender, genderqueer, a Fat Admirer and fat ally, and other things. I live in Jamaica Plain, and have a wonderful partner who lives in Washington, DC. I'm a writer, an artist, and a science fiction and fantasy fan. I'm proud to say I've been involved with MTPC since its founding, and have known and worked with some of its leaders since before that. MTPC is a truly vital and wonderful organization, and I want to help it continue to grow and improve. I've considered running for Steering Committee before, but didn't have the time. Now, I think it is time. I know I can use my experience, skills and connections to serve the organization and our community well. Thank you for your consideration. Whatever the results of these elections, I look forward to serving MTPC this next year and beyond." Can't wait to hear the outcome, and so proud of you!! Awww! Thank you, sweet one.